Starting with the positive – yesterday Z went on his first visit alone to HIS friend’s house (ie without his siblings or me! )MashaAllah Z has really taken to her son. We had arranged this about 10 days ago and he was counting down the days. I went to pick him up after a few hours and he was really happy to have visited his very own friend. He seems to be wanting more and more time with ‘his friends’ these days. I think he’s slowly leaving that ‘very youngish’ age where his parents and siblings were enough. What I realised, was how important it is that I provide the same opportunities for all my children and not just my first born. I had a full day of home ed planned today which completely went out of the window as I had to rush baby S to the hospital. Sadly, the situation has not been resolved, and if she is showing the same symptoms tomorrow, I am going to have to take her back to the hospital and demand some tests. I feel so frustrated with these hospitals! To end on a positive note, this time last year, I was enduring the pangs of labour…yes, I cannot believe it – baby S is going to be 1 years old tomorrow inshaAllah subhanAllah! I really don’t know where this year has gone. So, a little about baby S – she’s spoilt by all mashaAllah. We all love her to bits mashaAllah tabarakAllah. She loves Arabic anasheed. She stood alone in the middle of the room for the longest time ever today much to the delight of her siblings. She can say Ummaa (Ummi), -ish (points to the fish), uh oh (when something happens), and today she said another new word – ‘dog’! We couldn’t believe it. She actually pointed to a dog in a baby book that R reads to her about 5 times a day and said ‘dog’ and then kept on saying it whilst pointing which had us in fits of laughter. It was a nice end to a bit of a stressful day. I’m quite worried about her health subhanAllah. Please make dua for my little baby S – that Allah protects her and grants her good health. Ameen. 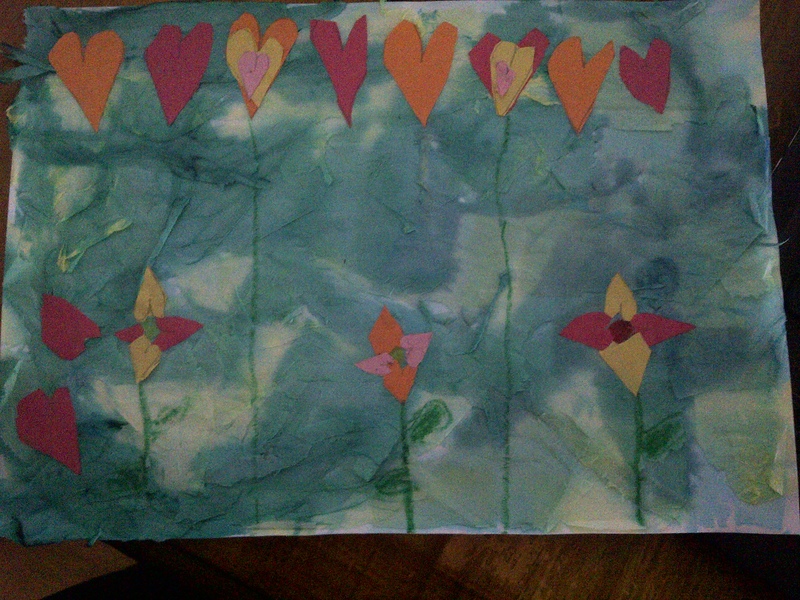 Once it was dry, R cut out hearts from coloured paper and created a Heart Garden. Simple and cute. 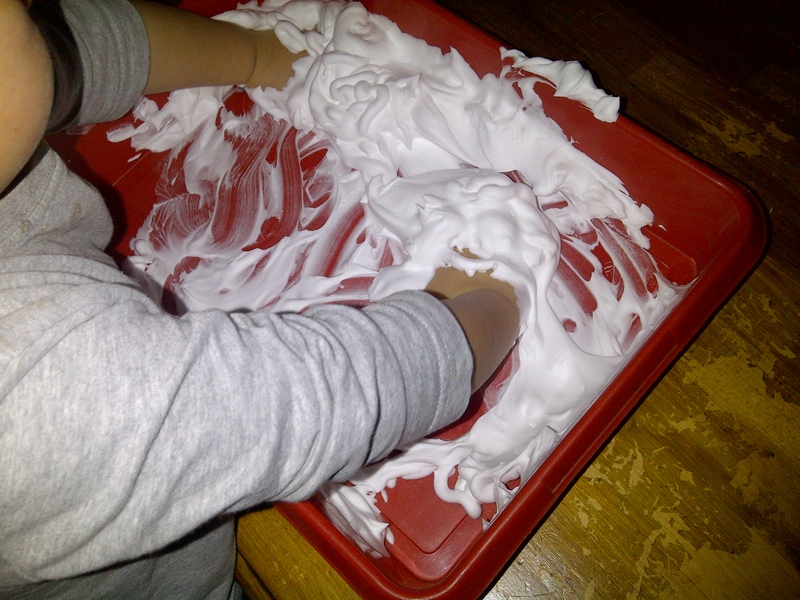 After she did this, a great way to occupy little ones without worrying about paint is give them a piece of paper and a pot of water and let them ‘paint’ the paper. What was good is that because R’s water had turned green, he thought it was paint! Simple art lesson. 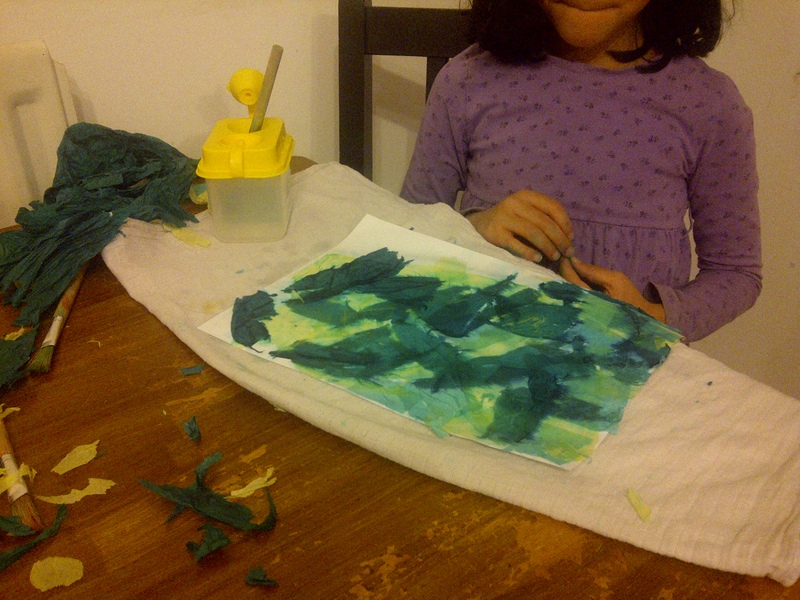 R ripped up different shades of yellow and green tissue paper and layered them on a piece of paper and painted them with ‘water’. The different colours bled into each other. Leave to dry. Just thought I would add this – it is an MEP lesson that we did. Hopefully it could give some of you an idea of what a 7 year old is learning at this stage of the MEP. 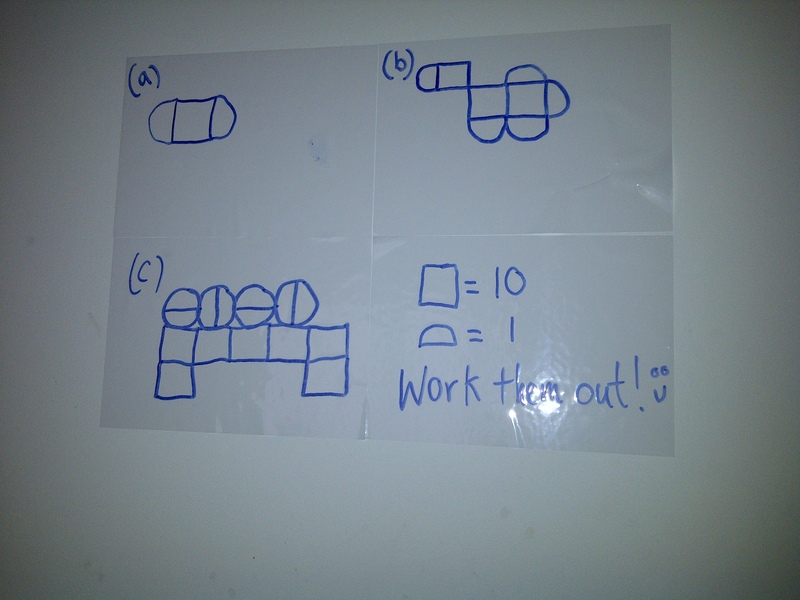 I had a complicated Math lesson with R and needed the boys to be occupied for quite a lot of time. So, got the box of old gone off lentils – into a tray with lots of boxes, funnels, spoons. They had fun for ages. And yes, by the end of it – the lentils were EVERYWHERE. Took a deep breath and within 10 minutes was all tidy. Sometimes we don’t let our kids do these things because of the mess but REMEMBER it can always be tidied up! 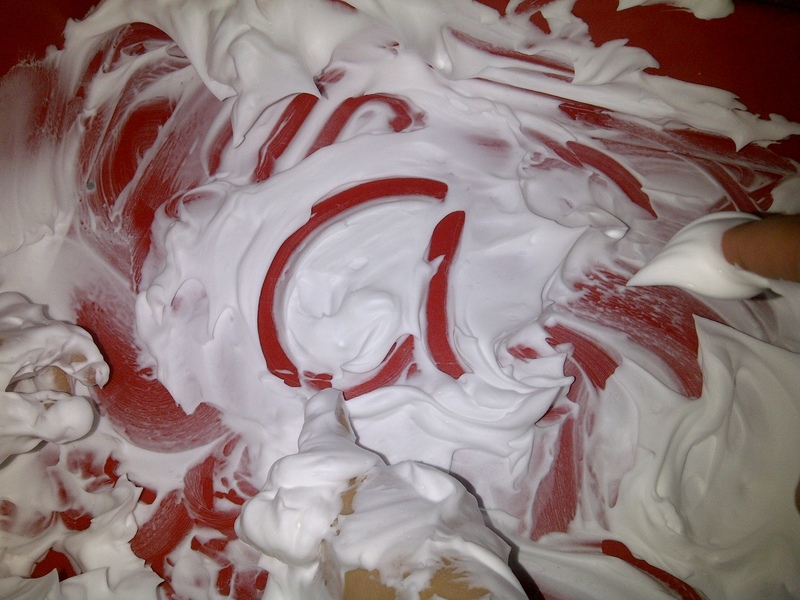 Phonics phonics phonics with Z at the moment. Something I did with R – drawing in a tray of foam. He loved this. So glad I can look back over my blog and get ideas I did with R – I can’t remember half of it – the memory of a mother! A sis I know who is a lawyer had to go to Russia a few weeks ago for a case. I asked her to bring something back from Russia as R has a collection of items from around the world. 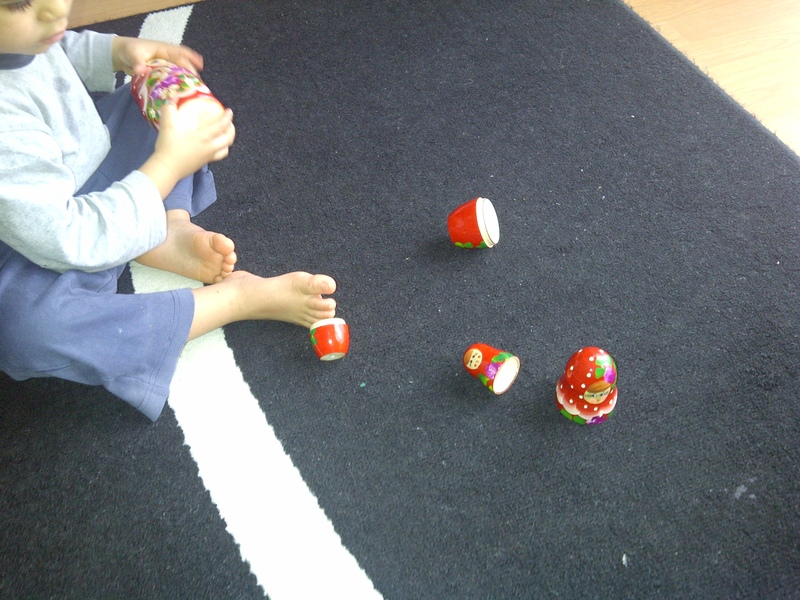 So she brought her a traditional Russian doll set. Y had a lot of fun with them and was a good ‘size lesson’ for Z. 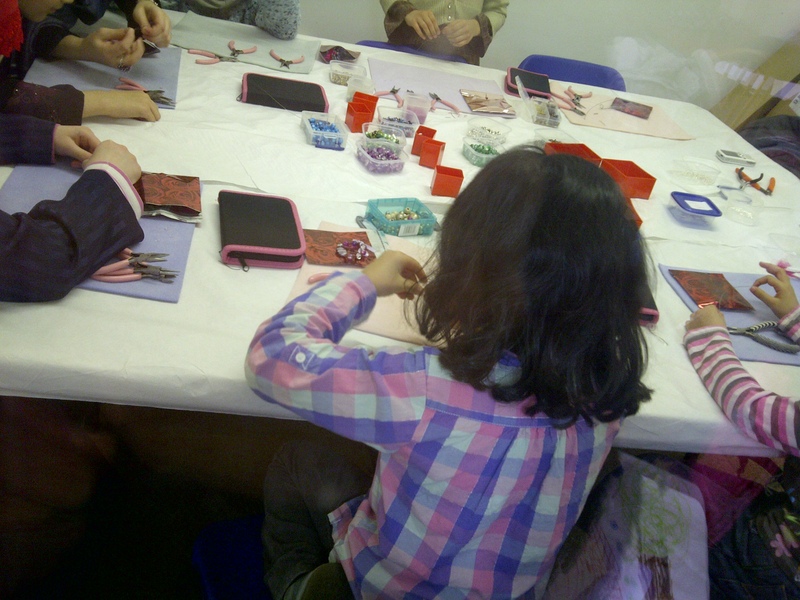 Last week R started a jewellery course I arranged (locally! so glad I didn’t have to travel). The course is run by a fellow home educating sister who makes jewellery and sells her pieces. It is a proper course with a syllabus mashaAllah. The girls LOOOOOOVED it. 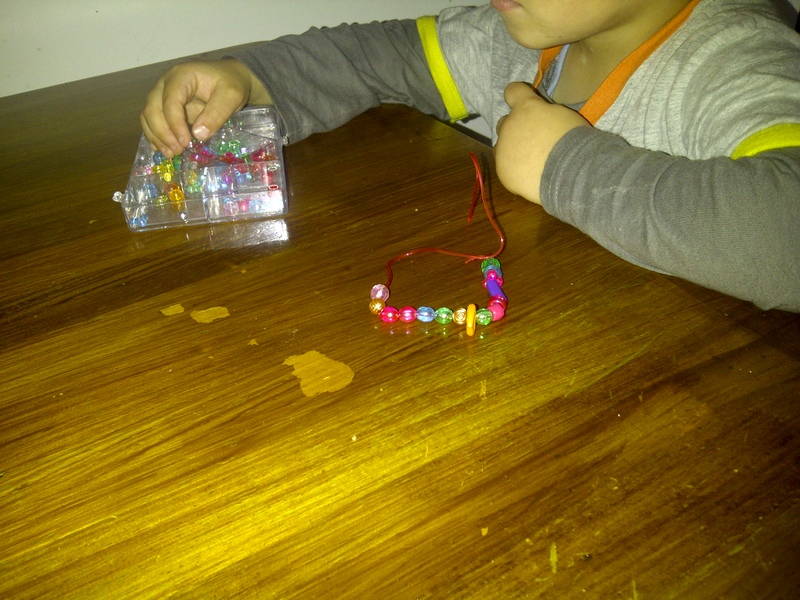 R learnt about beading, threading, wiring and used a range of tools. 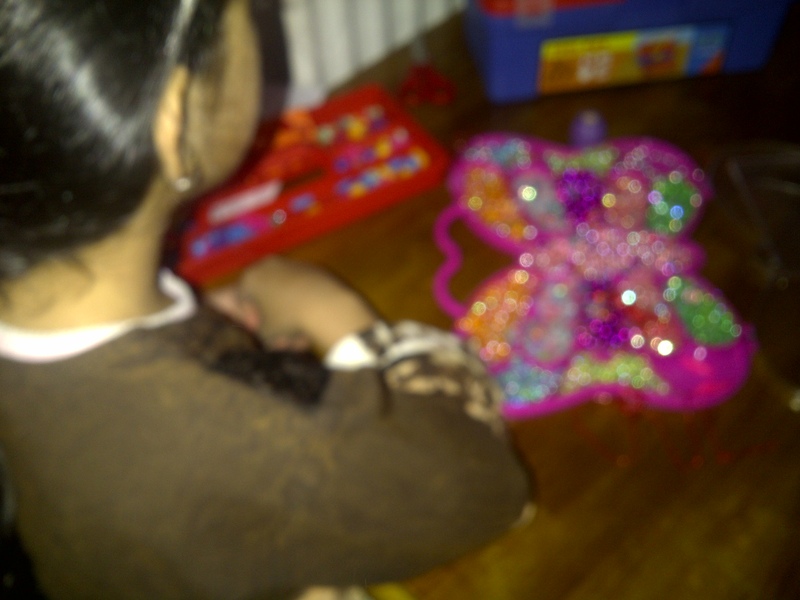 Very different to the normal toy beading they do at home. 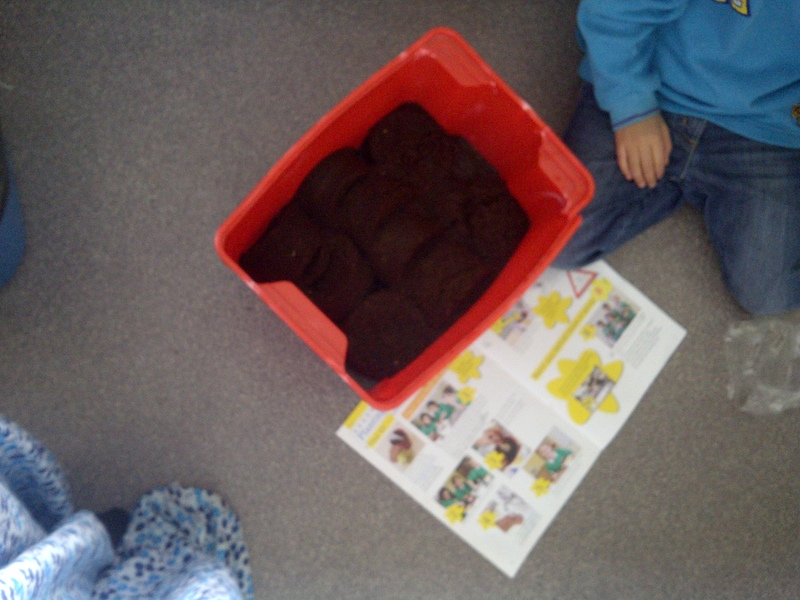 In line with our ‘Plants’ topic at the moment – we are planting a range of seeds. This set was a free set we ordered from Marie Curie last year. 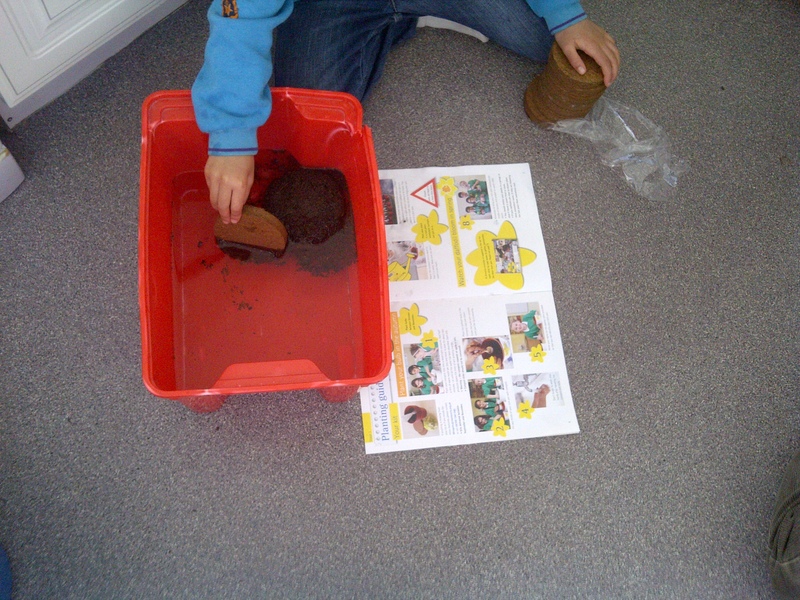 So, R is following the instructions and placing the compost discs in the a box of water. We’ve started a ‘Plants’ topic and covering the different parts of a plant at the moment. 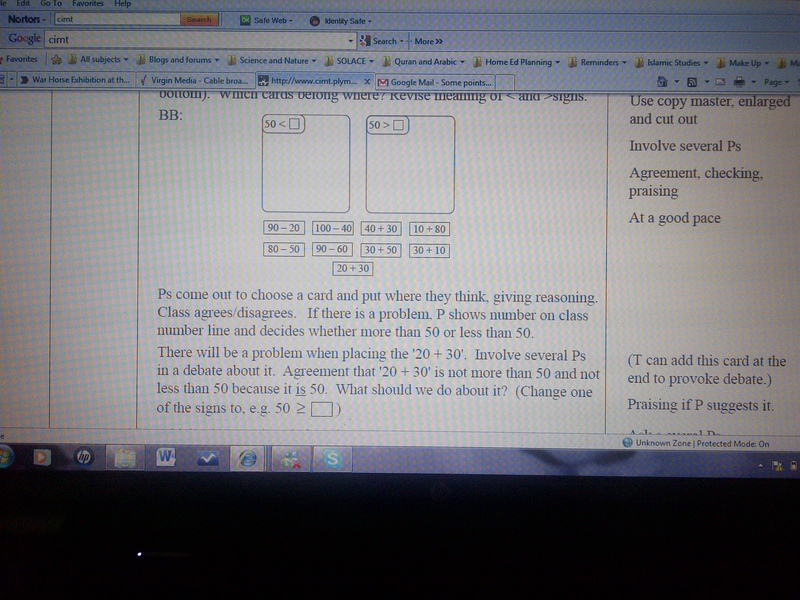 CGP Science key stage 2 came in handy. 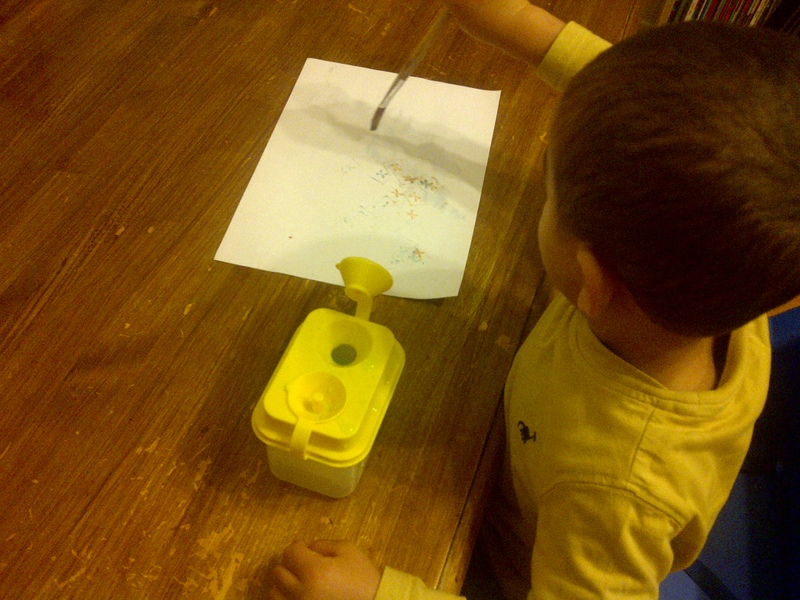 Here, I asked him to trace some letters with his finger. 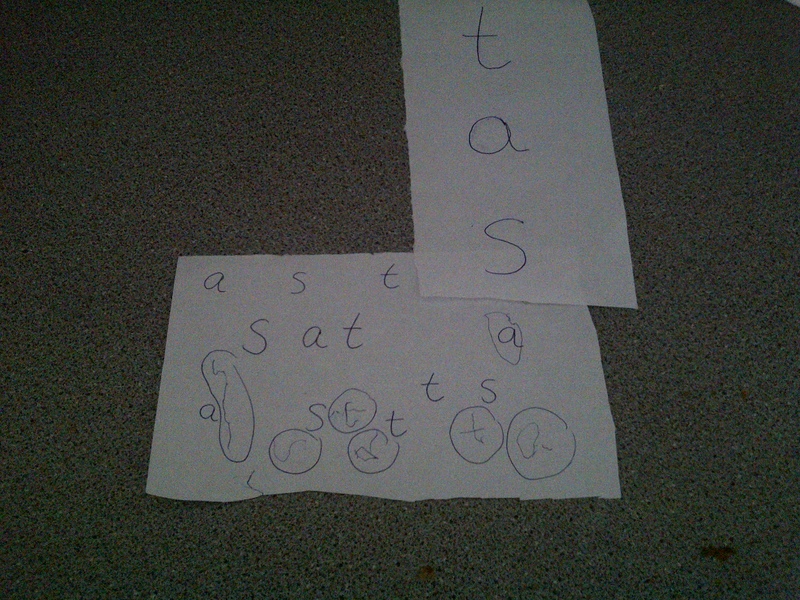 And the other page, I wrote the letters and he had to say the sounds as I wrote them. Then he snatched my pen and said I want to write some and he wrote a few all by himself. I circled them in the picture. Its the first time ever that he’s written some letters all on his own. I love moments like this. 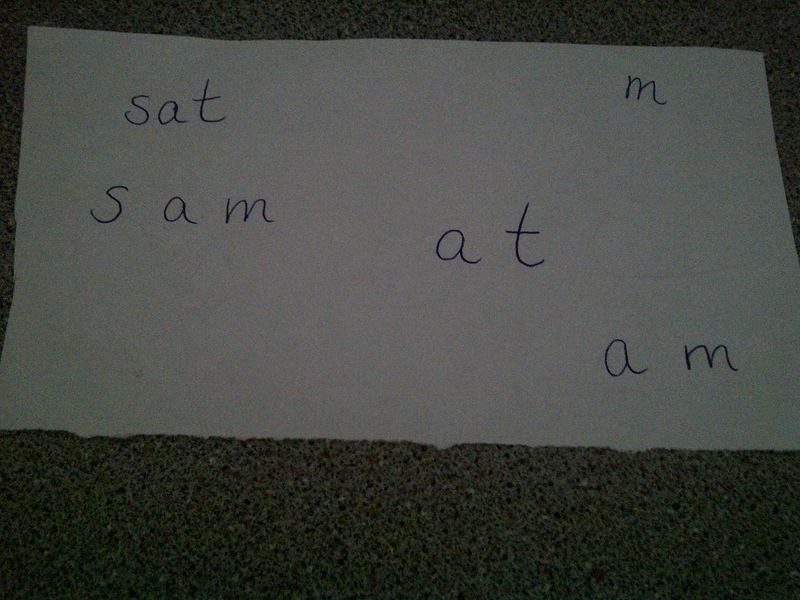 So far Z has learnt ‘s, a, t and m’ – so tried a bit of blending with him. He can identity all of them in true ‘jolly phonics style’ lol but blending is a tiny bit difficult. Will keep trying. Here are some plants_3-4_vocabulary_cards we used for our Plants topic incase anyone wants to use them. R matched up the words to their meaning and we discussed it in relation to what she read in this book plants_3-4_nf_book_-_mid. Z is my child who is different to the other two. He is my test. He is my child who shows me the most affection mashaAllah. He is who he is. Home Ed is definitely going to be different with him. He doesn’t learn like his sister does and his strong character is going to mean that I am going to have to do things differently with him. Z, like most boys his age loves trains, cars and is mad about fire engines and firemen! 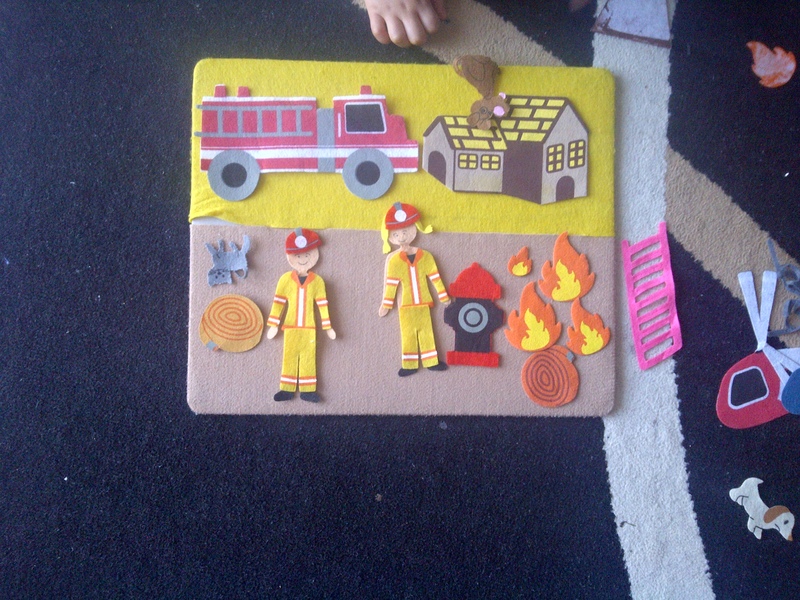 So, my house at the moment revolves around HORSES and FIRE ENGINES and in Y’s case – really smelly nappies – I need to start potty training that one! In the last few weeks, Z has noticed WORDS everywhere. He asks me to read slogans, supermarket labels – everything. I remember when R did this. I take it as a sign that he might be ready to learn some phonics and begin reading. I’m not going to push it though as he is very very very young. I’m going to do it in a really fun and easy way inshaAllah and see how it goes. I read to my kids A LOT and I believe this is something to continue which can hopefully aid their own reading. 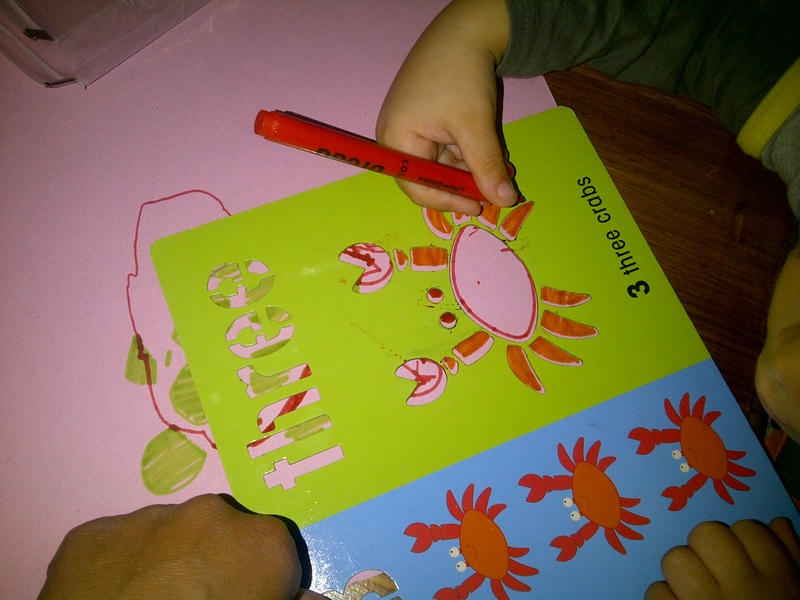 Z very proudly made his first lapbook before we went away. He finished all the mini books but we only put it together recently and he is very very happy with his first book! Last Friday R was booked for two trips in the Museum, a Bubbleworks show and a workshop on blood. She really enjoyed the Glorious Blood workshop. I guess all of these trips are a means of providing her with avenues in case she wants to venture down those paths further herself. HE Facilitation. I was speaking with one of the sisters there and we began talking about what she does with her little ones (she has 6 children ages 11 to a few months old mashaAllah) whilst she does formal work with the older ones. The conversation led to how much the children watch. For a long time now, I have felt uncomfortable about what my kids watch and how much they watch. We don’t have a TV – we got rid of all the free channels by cutting the cable off back in 2005 when R was only a year old. But we do have the internet, DVDs and iplayer. I have been reading up a lot about the ill effects of watching too much (in our case, not TV but maybe iplayer and youtube). I have decided after a bit of research to limit as much as I can and if they do watch then I’d like it to be something educational. With that in mind, I made a list of alternatives to watching and actually found that there are entire websites dedicated to providing lists of activities for all age groups so that watching is reduced or in some radical websites – eliminated completely! A recent alternative for us was the classic camp at home. I brought down sheets and blankets and draped them over our dining table. 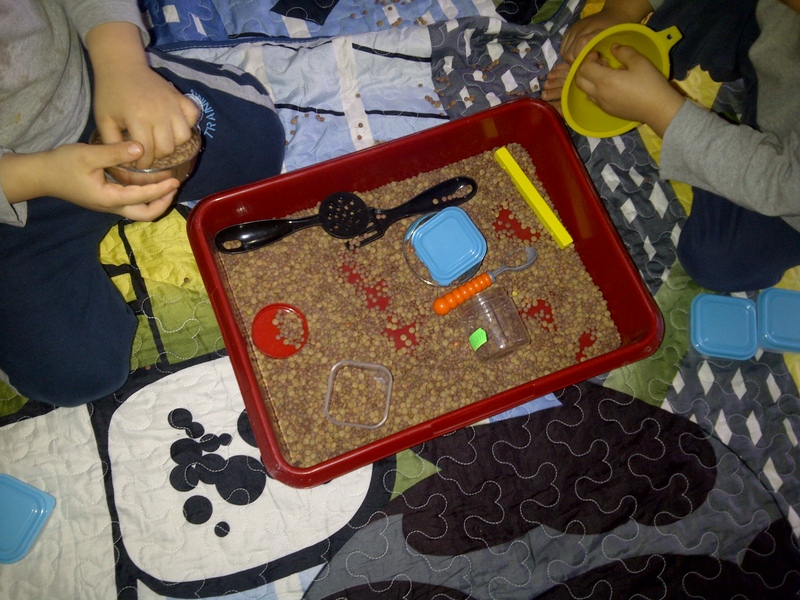 Boys and R loved it – just needed torches! As I mentioned in previous posts, doing formal work with R in the morning isn’t working. 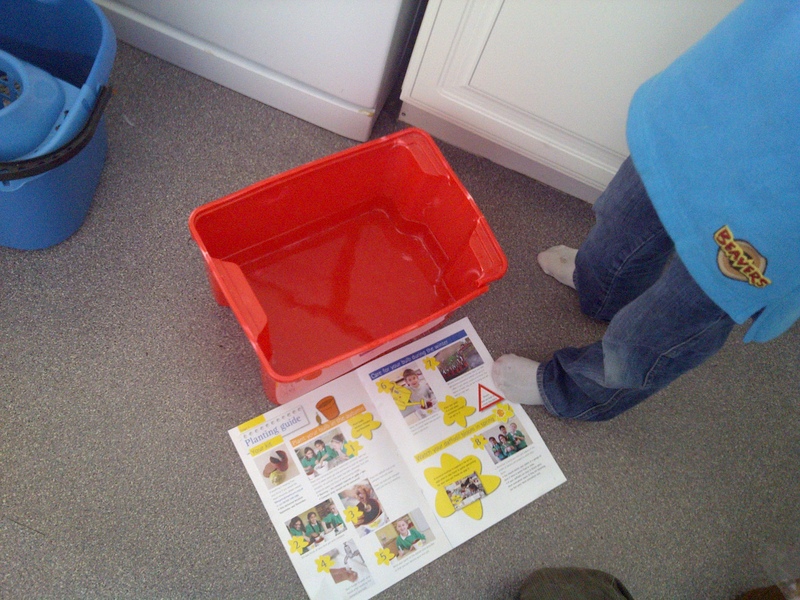 And so, for some time now we do our formal home ed in the afternoon instead. My boys are very active and with their Algerian blood they need to run otherwise they DESTROY! So, yesterday, as soon as breakfast was done, we ventured to our lovely local common. It was freezing cold but it was great mashaAllah. We started off in the empty children’s park and the kids played on the swings and slides. And then walked right to the top of the Common to visit the Rookery. On the way up there, we saw many live worms which caught the kids interest. R picked them up from the paths and moved them to the muddy grassy area (she was scared they would dry up in the sun!) Z then found a squashed dead worm which he became obsessed with and kept asking me why Why WHY it had died. A black crow squaking caught Y’s attention which we observed for some time. R then suggested that one day we come back and do some bird watching. I asked her what we would need for that (facilitation in play on my part). She said a notebook to note down their characteristics and then when we got home we could look them up in an encyclopedia. I asked her what the best season would be for bird watching (facilitation again) She said Spring. I asked her why and she said due to the mating season and all the activity that it involves – birds building nests, collecting food etc. The World was very much our classroom yesterday. And I felt grateful to Allah that we could share interesting discussions on a cold Monday morning instead of my children being locked up in a classroom with a curriculum that imprisons so many children. The kids had fun scootering back down the paths we had struggled to climb. We then saw a mushroom which led on to a discussion about fungi we eat and fungi we cannot eat. Back home, the boys were shattered (yes!) – warm pasta for lunch and hot chocolate. 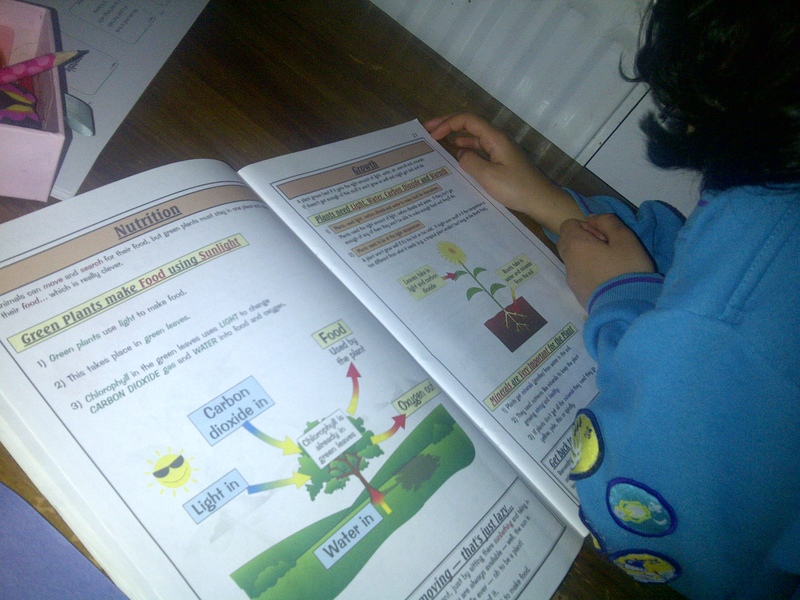 And then it was Quran, Maths and R declared she was going to do some work on her horse project instead of her formal English textbook work – which I definitely agreed to! R then had kickboxing in the evening. Oh, and one extra good thing about yesterday’s 2.5 hours in the park was that the kids got a lot of exercise and so did I. It is very much all about alternatives for us at the moment. Before we left for Hajj, I was testing out the unschooling waters and mashaAllah saw many benefits not just for R but as an entire family. Often, I see a trend in many home educators (including myself) where we concentrate so much on the eldest child and neglect to some extent the holistic education of subsequent children. I can see how easy it is to fall into this pattern especially if the little ones are perhaps preschool age or younger. It is something that I am trying not to do. Each of my children are special in their own right and in their own position in the family; be it 1st, 2nd or youngest! On that basis, I have shuffled things around a bit. Now that we will be adopting a semi structured approach, I am leaving all formal PLANNED learning til the afternoon when at least one of the boys is napping. Z doesn’t look like he’ll be napping for very much longer in the afternoon. After breakfast – kids played – poor Y – he always ends up in a doll’s cardigan! 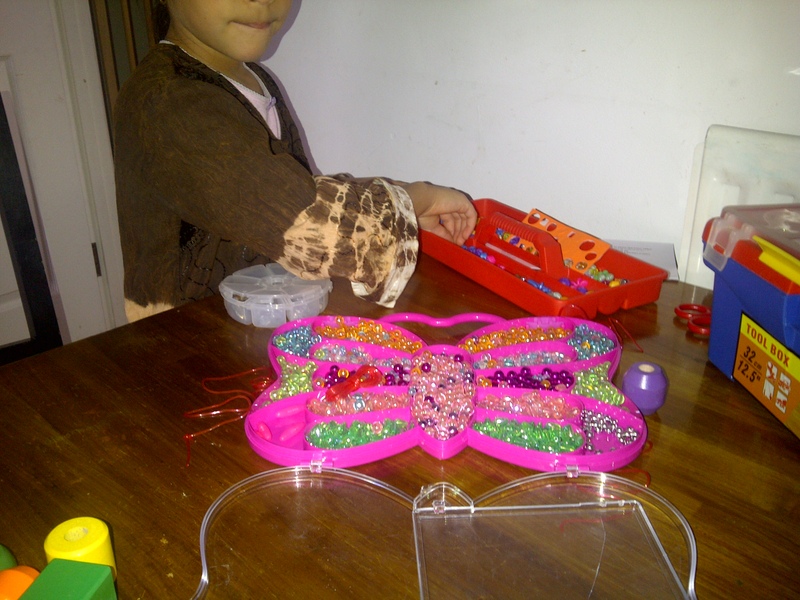 Then, I brought down R’s beads and the large Melissa and Doug beads and all of them enjoyed beading for around 40 minutes. I sat with them whilst they were doing this. I had actually thought that Z and Y would share the large toddler beads but Z surprised me by choosing R’s beads and made me his first ever bracelet! 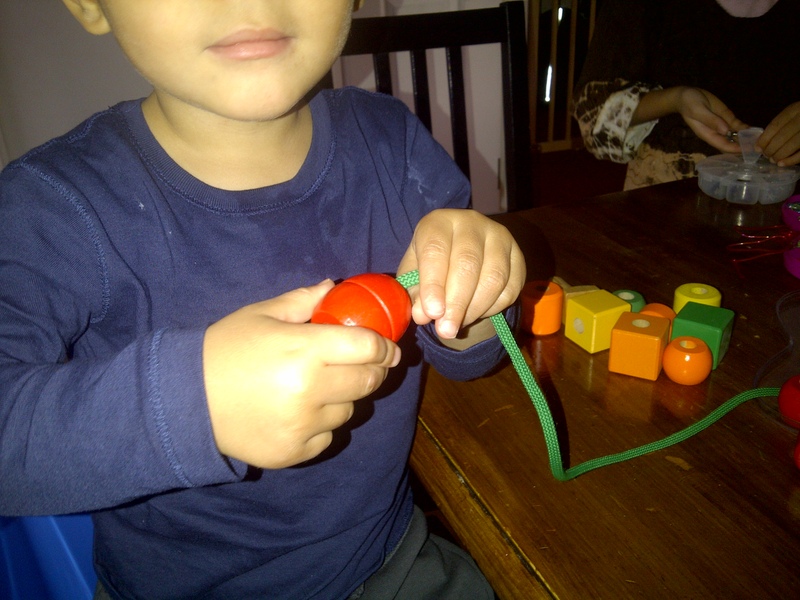 Good way of developing his fine motor skills. Was also very pleasantly surprised to see him quietly concentrating for so long. Y got bored after a wall and so took out the box of animals. 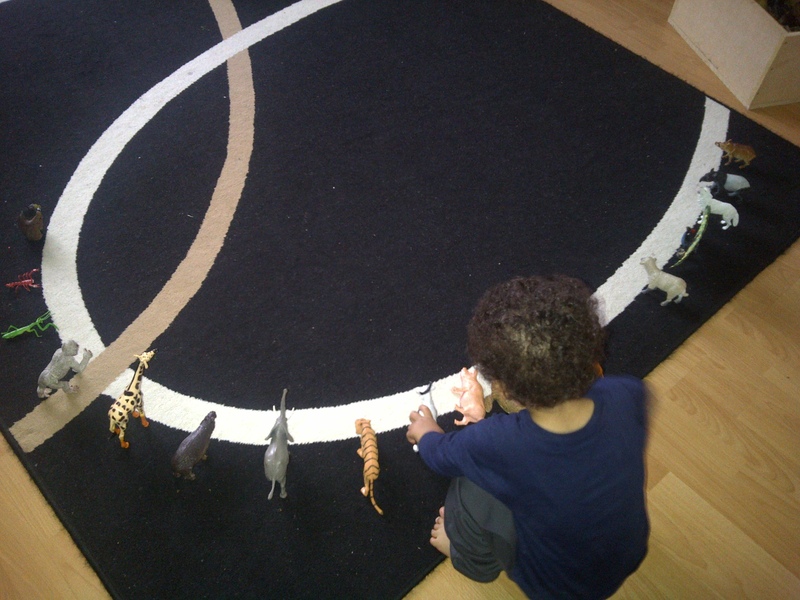 Whilst he was away, his vocabulary really picked up mashAllah and now he knows the names of quite a few animals and was very happy to tell me them as I lined up the animals for him. 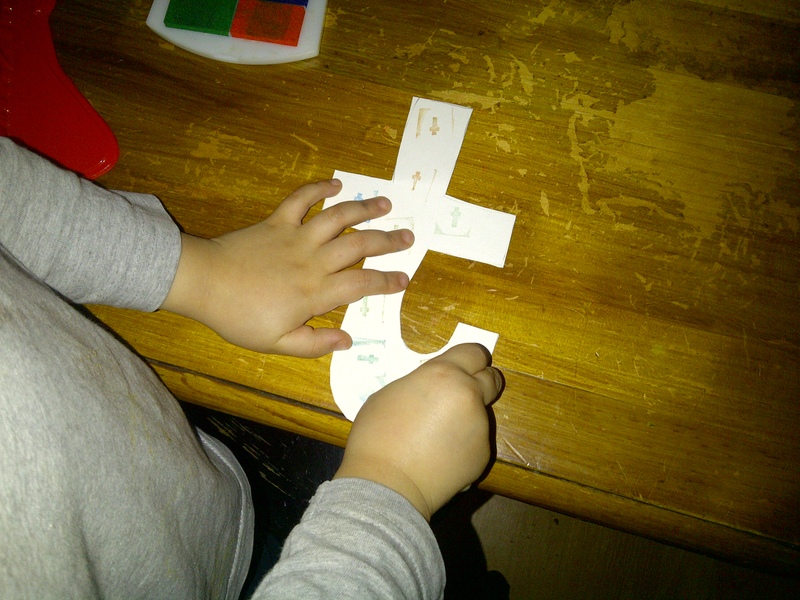 R was still making a necklace for me and so the boys and I did some stenciling. Made some spaghetti and had lunch. R decided she wanted to make a Mosaic frame from an Art book she took out from the library last week. She read the instructions and started right away. She wants to frame a painting she recently completed. 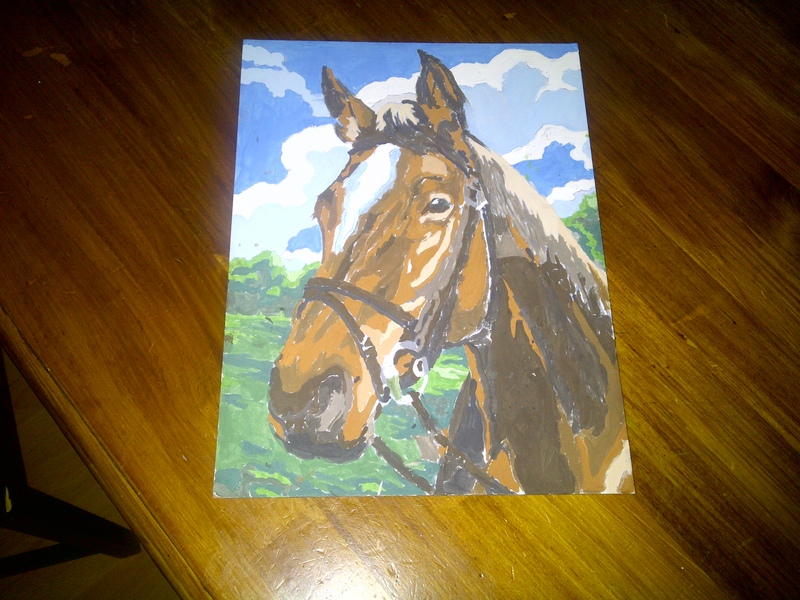 It is an adult paint by number of a horse that she finished a few days ago. It was quite difficult as each piece to paint is quite tiny and the paintbrush is very fine but she finished it (I think it took her almost 2 months). 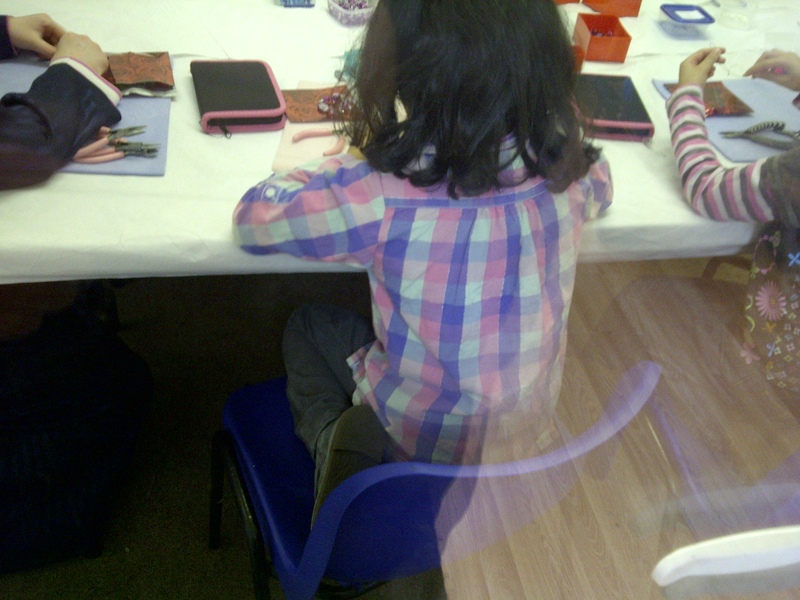 R had to make the mosaic pieces and as the pattern involves tessellation, she had to draw a grid of 1cm x1cm squares. It was a good opportunity to bring a bit of Math and we discussed the centimetres and millimetres and a square having equal sides and the importance of precision and patience. After this, she cut up the squares from two different pieces of coloured card. 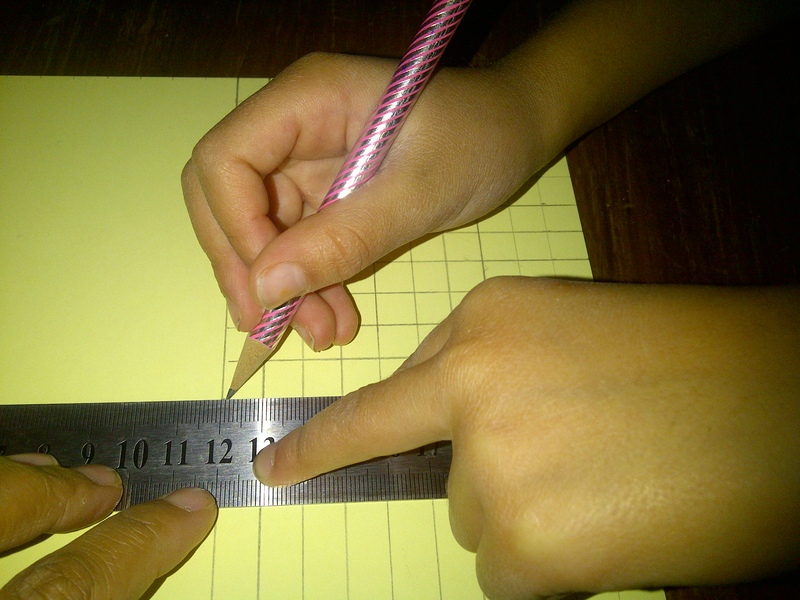 R then did Mental Math, two pages on measuring from the MEP Year 2 book. 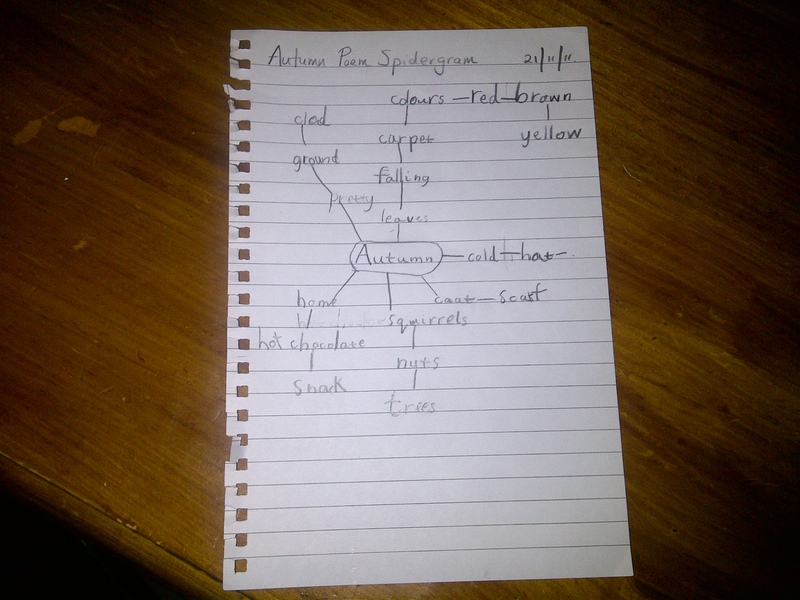 R is going to write a poem about Autumn and so she started a Spidergram in preparation for her poem content. Got R ready for kickboxing – she’s really motivated as she won ‘Student of the month’ and received a certificate and prize last week. Her instructor said she was very good in her techniques and behaviour. I think this is what she needed in order to increase her confidence – something I’m really worried about. I’ve noticed she is losing her confidence in many things – Im not sure if it is age related. Her instructor said she’s now ready for grading and so R is going to attempt to go for a kickboxing belt in a few weeks time. (I often like to write these posts more for myself than anyone else. It allows me to see how much quality time Im giving to my kids (if any) and where I am wasting time and how I can better make use of my time. Although this blog is public, my main goal is recording this home ed journey so that my children and I can look back at it when they are young adults inshaAllah). 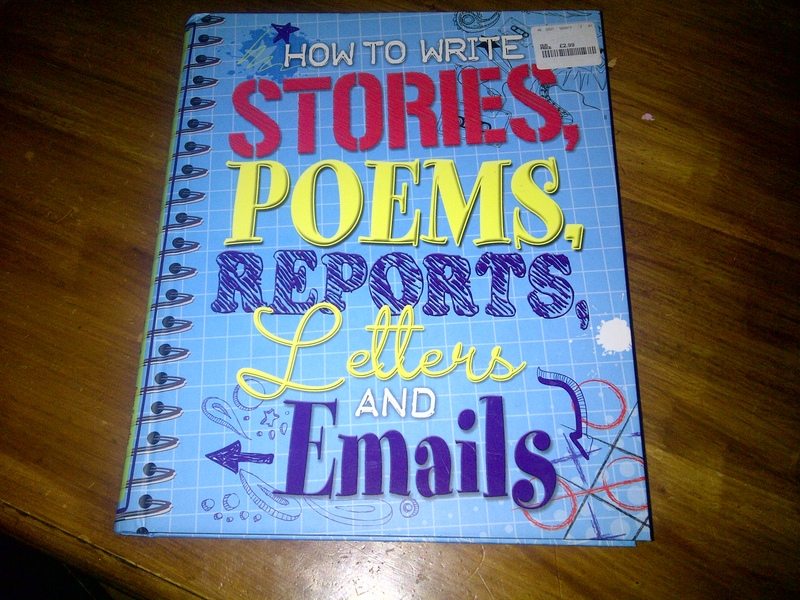 Last night, I wrote down R’s list of what she would need to complete for today, Monday 10 Oct. After spending a considerable amount of time yesterday reading unschooling articles, pondering, reading some more – I decided to ditch the list and try out unschooling for 2 weeks!!! 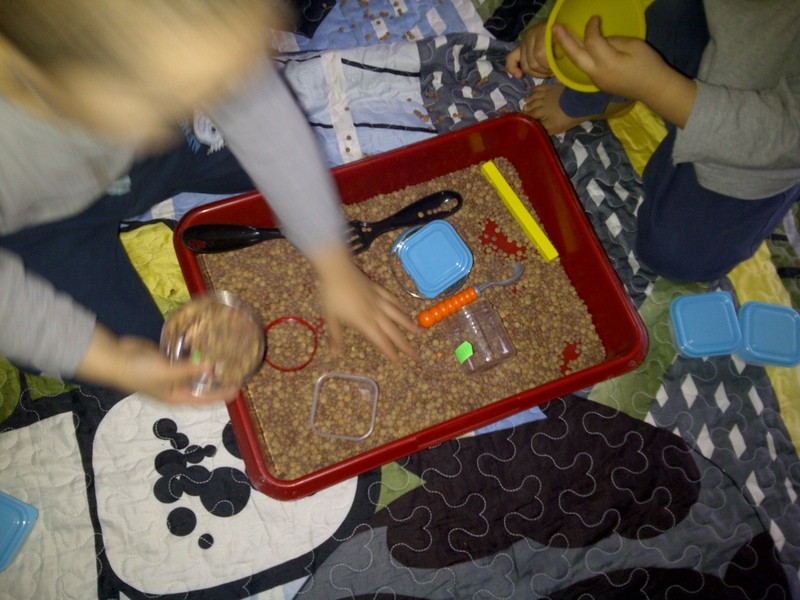 I’ll be recording our unschooling days as regularly as I can here on the blog inshaAllah! I couldn’t go back to sleep, so eventually strolled out of bed and put the washing machine on. Over breakfast, informed them that we will be trying out a different method of ‘school’ and that basically they are free to choose what they want to do/what they want to learn. Only thing they have to do is Quran. R was really surprised. Still eating breakfast, R asks me ‘Where are Vikings from?’ We discussed this and then I made a mental note to get a library book about it. – A bit of history! 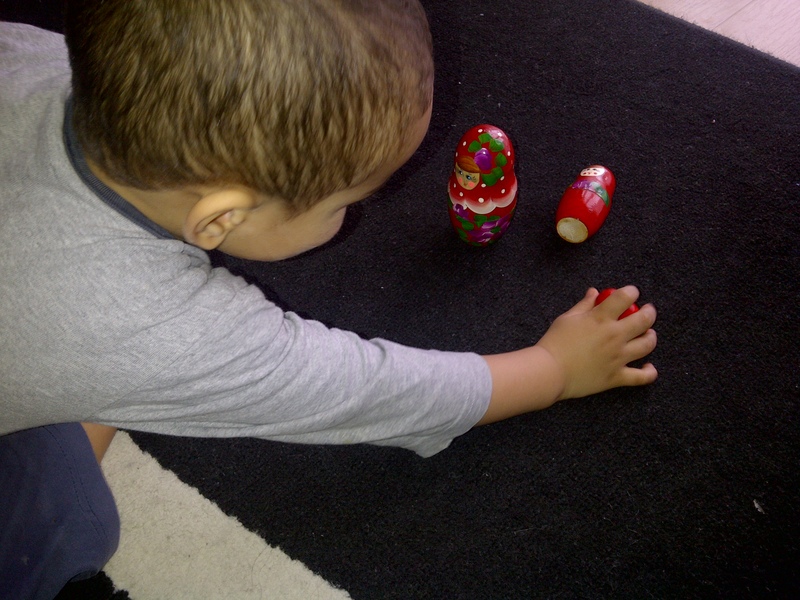 Z decided to show me step by step how he can go to the toilet by himself. – Practical! Then R brought ‘Chocolate World’ for me to read. Read a short story for her. Excellent Islamic book – quite deep and great lessons to be learnt. Today, the story was abotu 3 children whose parents had died and the lesson was tawakkul (reliance on Allah) – English. Kids watched some cartoons whilst I FINALLY tended to the dishes from breakfast and lunch! Anyone who knows me personally or has been reading this blog for long enough, knows how particular I am about cleaning. But have decided that my kids are MORE IMPORTANT than a clean sink!! At this point, thats when the test hit me. R wasn’t doing anything. She said she didn’t know what to do and was looking utterly bored! I gave her some options. Texted the sister to ask her what her daughter likes as R wanted to make something based on the girl’s interests. Received text back that she likes cats! Forgot to give R a letter that had come for her in the post. It was the latest edition of Little Explorers Magazine. Got ready for bed, duas and that was it for the day!